The best noir is the kind that hits close to home, the kind that feels like it's absolutely true. 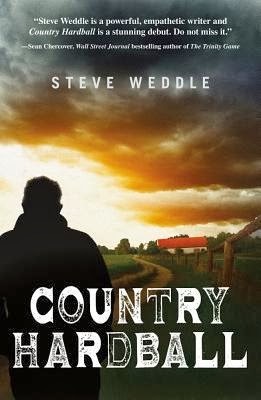 Steve Weddle's Country Hardball is like that: a piece of fiction that feels like a slice of real life. Weddle's prose hits hard and fast, and the narrative is packed with sadness and the kind of everyday struggles that most of us face at one time or another. That mix of authenticity and great writing makes Country Hardball one of the best debut novels I've read in a long time. Country Hardball follows Roy Alison, a man who spent more than a decade in and out of juvenile detention, halfway houses, and jail. With his history, short temper, and bad luck, Roy has a hard time going straight. He moves back to his hometown and starts living with his grandmother. He wants to leave his past behind and move on to bigger and better things, but what he finds is a town full of broken dreams, poor folks, and bad intentions. He also uncovers a long family history of bad choices and worse consequences. Small towns can be big hells when everyone is suffering from a busted economy and a lack of opportunities, and Ray will learn that the hard way. "Yeah, I'd done things I wasn't proud of. The accident with my parents. A few other things that ended up with people dying. Put a man down in self-defense. Finished a fight I hadn't started. The neck is a fragile twig. But I deserved my time for some of that and that was behind me. Someone else's life. Not who I'd wanted to be, who I'd become. I knew that if I lived clean from here on out, woke up every morning in the light, things would be fine. I was starting from scratch. Only this point on counts. A good job. Coworkers. Friends. The sunlight. The glare from the road. The summer brightness of things not yet destroyed." Weddle achieves a rare balance between poetry and destruction, brutal honesty and deep respect for his character regardless of their flaws. More importantly, the narrative offers a nonjudgmental look at the life of regular folks living a busted economy in contemporary rural Arkansas. If you like your noir with a nonchalant sense of elegance, full of brutality, and with a side of truth, don't miss this one.